With the departure date for my trip is getting closer, I decided that I better start getting back in shape. So one of things I started doing is taking a walk every day again. I used to walk a mile every day before he got sick. Since I worked from home, I didn’t want to always to feel coupe up in the house all day so I used to take a walk around the block. Well, I haven’t done that for awhile and actually missed it. However, the temporary home does not have a block so I couldn’t figure how where the mile marker would be. So I used the Google Maps to plot my mile marker to the south and the north so I can change up my walk every other day. 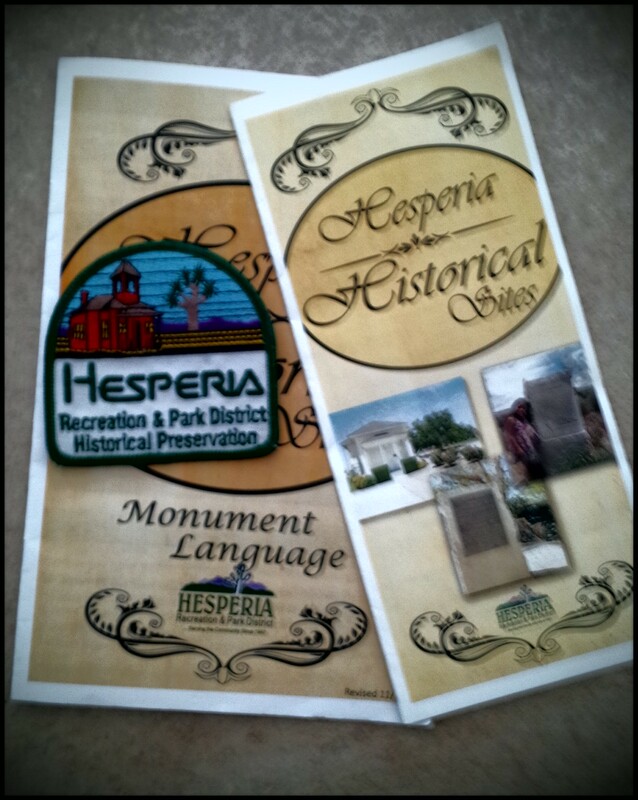 Well on my walk south, I came upon one of 15 historical markers that the City of Hesperia has put up all over the city. I had forgotten about these. The city has put these up to preserve the city’s heritage for the present and future residents to enjoy. 1. Hesperia’s First School 1883-1957 – This one of the oldest existing building here in Hesperia. 2. Walters Store and House built in 1915 – This is also one of the oldest existing business building in Hesperia. 3. Hesperia Hotel and Train Station built in the 1880’s – The first hotel and railroad station was built here. The buildings no longer exist. 4. John Brown Road Crossing at Main Street built in 1870 – In 1870’s, a road builder John Brown built a 10 mile road running between Cajon’s old summit and the prehistoric Mojave Trail. In 1913, part of this road became America’s first transcontinental highway. 5. John Brown Road Crossing at the Mojave Trail Crossing built in 1870 – He enlarged a detour over Mojave River which became a major thoroughfare. Padre Garces, Jed Smith, Kit Carson, and the Mormon Battalion (with the first known vehicle to have crossed the desert) passed this location. 6. 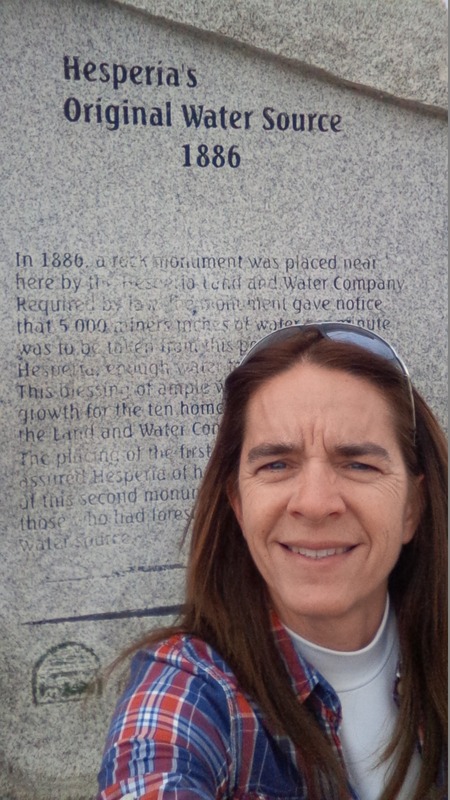 Hesperia’s Original water Source – In 1886, a rock monument was placed here by the Hesperia Land and Water Company. This was required by law to give notice to 5,000 miners that water was to be taken from this point for use in Hesperia. 7. Atongai Indian Village – oldest known settlement in Hesperia. 8. Summit Train Station built in 1880’s – this was an important railroad center but started to decline in the 60’s and no longer exists. 9. Elliot’s Ranch built in 1927 – This area is famous for where thousands of stolen horses and mules were driven through here en route to Utah for reselling. 10. Miller’s Corner built in 1923 – It was created when State Highway 31-C bypassed downtown Hesperia. this corner received its name from an auto mechanic name Miller who built a garage here. 11. Hesperia’s First General Store built in 1850 – It was the first commercial building in Topipa, Hesperia’s original Indian name. 12. Original Water Supply Ditch built in 1886 – This was part of our backyard which by 1950’s, it was filled with soil due to new wells. 13. 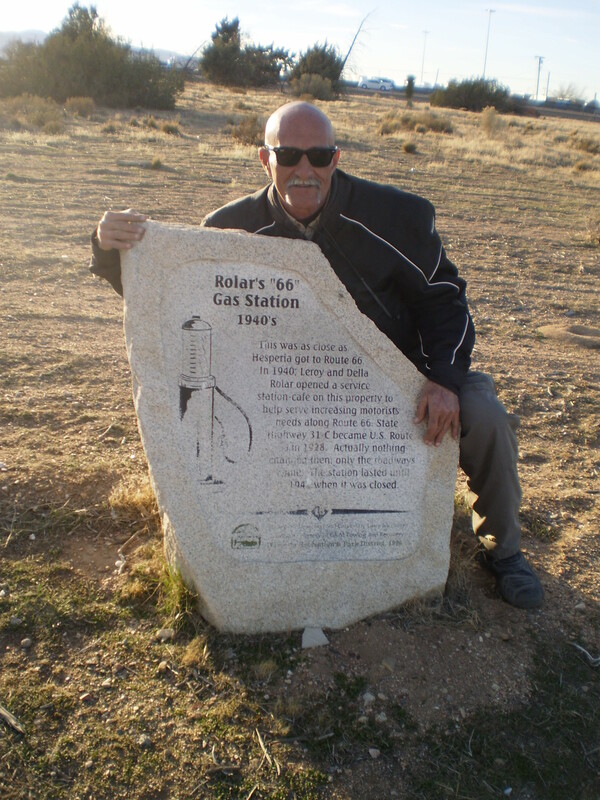 Rolar’s 66 Gas Station built in 1940 – Leroy and Della Rolar opened a service station-cafe to help serve increasing motorists needs along Route 66. State Highway 31-C became U.S. Route 66 in 1928. 14. Mojave Indian Trail/Hesperia Lake – Over 12,000 years ago, the Anasazi People originally used the trail. 15. Holcomb Valley Road built in 1861 – A free, graded road crossed here, running from Holcomb Valley to join the Brown Toll Road through the Cajon Pass. Once you have visited all of the sites then they give you a patch for your accomplishment. My husband and I did this a couple of years ago but we never went to pick up our patches. So I decided it was time to pick up mine so I would have at least a reminder of the things we have done together. Have you ever wondered what historical significance your home town has? If you haven’t, I ask you to look and find out what you have in your own backyard? I love the historic stuff, thanks! So did we…we always try to hunt them out. Hopefully, I’ll find more on the trip. As a genealogy and history buff, I love this kind of “stuff”….the TW Gang is only 2 months away from our “Moab Adventure” March 21st-28th…Spring Fever has set in, can’t wait! Awesome…I wish I could have made it to Moab….my adventure is only a little over 3 months away…so excited! Excited to find this post about all the sites. Where can I find out where all these Hesperia markers are? I’ve been to the old schoolhouse and Walters Store. I was trying to find out about the old hotel when I found this page. I’m also very interested in John Brown’s Toll Road and Route 66. You can get brochures at the Lime Street Park which is on the corner of Lime and Hesperia road. Okay — I found the “Hesperia Old Town Museum Collection” Facebook page, which has the brochure’s map with all the locations. Thanks, again.